Jorge Ramírez Díaz develops strategic communications and marketing strategies for a range of clients in the corporate and healthcare and wellness arenas. Jorge brings to Newlink a solid strategic expertise developing and executing marketing programs that drive results and create brand awareness for clients. In recent years, he has transformed the medical and pharmaceutical industries by developing marketing programs for various world-renowned clients and organizations including Merck Sharp & Dohme, Bayer, Eli Lilly, Abbott, GlaxoSmithKline, Lundbeck, Johnson & Johnson, New England Journal of Medicine, Bouhringer Ingelheim, Pfizer and Novartis. Before joining Newlink, Jorge was president of Cohn & Wolfe Mexico, a global communications agency that, in just two years, managed to rank among the country’s top 10. In Mexico, he was also vice president of Fleishman-Hillard and helped with advertising for Grey Healthcare Group. 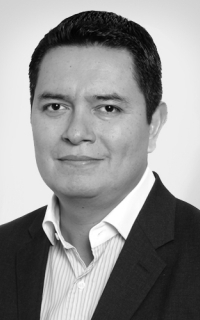 Throughout his career, Jorge has worked with clients such as The Coca-Cola Company, Hershey’s, Mexicana Airlines, Yahoo! and Volkswagen.